Curved Face Red Coral & Garnet 925 Sterling Silver Jewelry Earring 3"
Earring Material: Red Coral(25mm). Main Stone Coral. Silver Type: 925 Sterling Silver. Hook Type: French wires. Fastening Hook. Main Color Red. Bottom line. US: FREE FREE. Earring Material: Red coral. Main Stone Coral. Earring Material: 925 Sterling silver. Hook Material: 925 sterling silver. Fastening 925 sterling silver. Main Color Red. Item Code: 10991-73930. 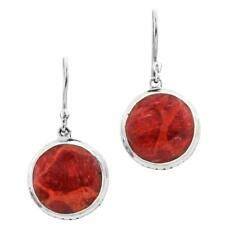 Earring Material: Genuine red coral. Main Stone Coral. Silver Type: 925 sterling silver. Main Color Red. Bottom line. Style Drop/Dangle. Earring Weight: ~3 gram/ea. US: FREE FREE. Earring Material: Biwa freshwater pearl(6mm). Earring Material: Red coral(20mm). Silver Type: 925 Sterling Silver. Main Stone Coral. Main Color Red. Bottom line. 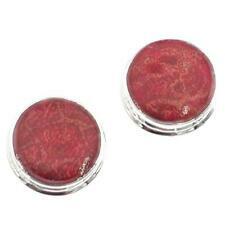 Earring Material: Red Coral(15mm). Main Stone Coral. Earring Material: 925 sterling silver. Main Color Red. Bottom line. Item Code: 10749-73907. Earring Material: Red coral. Main Stone Coral. Silver Type: 925 Sterling Silver. Main Color Red. Length 3/4". Style Drop/Dangle. Bottom line. Earring Material: Red coral. Main Stone Coral. Earring Material: 925 Sterling silver. Main Color Red. Style Drop/Dangle. Bottom line. A pair of marquise shaped Red Coral and 925 Sterling Silver earrings with silver detailing They have rounded surfaces and flat backs and are 925 stamped on the backs. Earring Material: Red coral(20mm). Main Stone Coral. Silver Type: 925 Sterling Silver. Main Color Red. Style Drop/Dangle. Bottom line. We are very fair and easy to deal with. We shall try our best to resolve the issue. Earring Material: Red sponge coral. Main Stone Sponge coral. Earring Material: 925 Sterling silver. Main Color Red. Length 1 3/8". Style Drop/Dangle. Bottom line. Shell Type: Red coral. Main Stone Coral. Earring Material: 925 sterling silver. Main Color Red. Country of Manufacture Indonesia. Style Drop/Dangle. Bottom line. Earring Material: Genuine sponge coral. Main Stone Coral. Hook Material: 925 sterling silver. Fastening 925 sterling silver. Main Color Red. Style Drop/Dangle. Bottom line. Earring Material: Red coral. Main Stone Coral. Earring Material: 925 Sterling silver. Main Color Red. Style Drop/Dangle. Bottom line. Item Code: 7273-67003. We are last 10 years in this field. And a reputed Jewelry Firm in Jaipur (India). We want you to be 100% satisfied with our products and our service. 100% BODY SAFE HYPOALLERGENIC, NICKLE, LEAD AND CADMIUM FREE. 100% BODY SAFE HYPOALLERGENIC, NICKLE, LEAD AND CADMIUM FREE. We are last 10 years in this field. And a reputed Jewelry Firm in Jaipur (India). It's Safe and Secure. We want you to be 100% satisfied with our products and our service. Stunning Handmade Coral Studs, Made from 100% pure 925 sterling Silver. NOTE :- 1. Our Jewelry is made up of pure 925 sterling silver and semi precious gemstone. CUSTOMIZATION: We can customize this product as per your liking. We are very fair and easy to deal with. We shall try our best to resolve the issue. which is the best and safest gateway service available in world.